Welcome to Life Science review Lapbook on Cells. Join in or follow along as my children and I create a lapbook on cells as part of our Biology curriculum. Most lapbooks can be created in a few hours or in an afternoon of concentrated work. However, I want to spread out our study over a 5 day school week. This is part of our summer studies and a conclusion to our last school year. By doing this lapbook it will refresh the topic and review the important items. Another benefit I expect is if they didn't catch something or understand it the first time, this new presentation of the materials in a lapbook format, will give them another opportunity to "get it". Hopefully, this process will help you create your own Lapbook Cells or inspire you to try lapbooking a topic of your choice. Step 1: Gather materials needed for each child. Step 2: Gather needed information and identify areas of focus. For this lapbook our area of focus is Cells. We will want to identify different types of cells and their components and component functions. An older student could also include in this lapbook information on Cell Division and Material Transport. I also want to add some fun elements. For my artistic child I may let him draw, color or paint, a plant or animal cell. Or for my creative, technical child, I may have him create a Cell game. Of course, vocabulary is important and I will want to include some type of vocabulary list with definitions. To gather information I will visit trusted online sources and the library. I will also pull out several Biology texts from our school books. If I need more resources, I will check with homeschooling friends, visit rummage sales and thrift stores and any local book sales. The material I gather will be from basic information on cells to the most complex I can find. One amazing site on Cells that I have found is called the Tree of Life. This site presents models of cells in an interactive format. I will let the children "play" around on the model while I gather the supplies. Teach material for the day....generally about 5-15 minutes worth of material. A goo place to begin is with the cell structures and organelles. Allow students to illustrate or write (using the template or format of their choice) about two key cell components. If the student creates a paragraph on the computer and prints it out on a full sheet of paper that paper can be folded in half and the student can label and decorate the outside area that will not be glued down. Or allow students to draw and label an animal and a plant cell.If you want to add a built in testing feature...have the student create a simple rectangular fold with the label on top and on the inside include the definition. 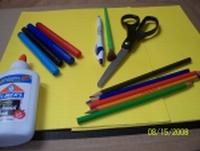 Allow students to paste their creations into the lapbook. Today have the students create and study the vocabulary lists.Usually about 10 words is good for one session. This can be adapted to the students abilities and age. Each day another list can be added. While the students are working on the vocabulary I will gather information about the cell life cycle or about how things move in and out of a cell. Teach cell cycle or material exchange. Allow students to illustrate or write about today's lesson. Finish by gluing into lapbook. Review all material in lapbook. Repeat steps from Day 3 doing the alternate lesson. Remember to review all material at the end and if possible in the beginning of the next session. At this point, if all the material has been covered, I would assign a fun project. Make up a Cell transport game. Write a poem about Osmosis or about the Nucleus or one of the other functions or organelles. Get out the markers, paints, color pencils and let them create an cellular image.